We are now putting our knowledge and experience to use to help others, with a range of services aimed at providing support, education and awareness of gambling related harm. Areas covered include gambling psychology, how to spot ‘red flags’, how to screen for potential harm and advice to front line workers on how to work with this issue. Our content has been developed by a team of former gamblers, with the assistance of health professionals, training and coaching experts in the field of gambler and addiction behaviour. It can be tailored as necessary to your organisational levels of understanding, or specific health and wellbeing requirements. Do you require a support service addressing gambling related harm? 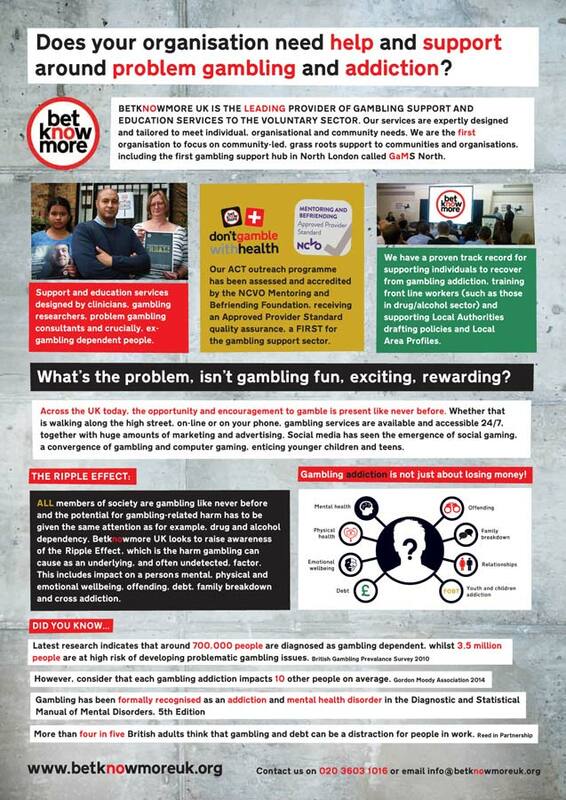 In 2014 Betknowmore UK launched the first dedicated outreach support programme for gambling dependency. In 2016, our ACT (Abstinent Cycle Tools) programme became the first externally validated outreach service for the UK gambling sector. 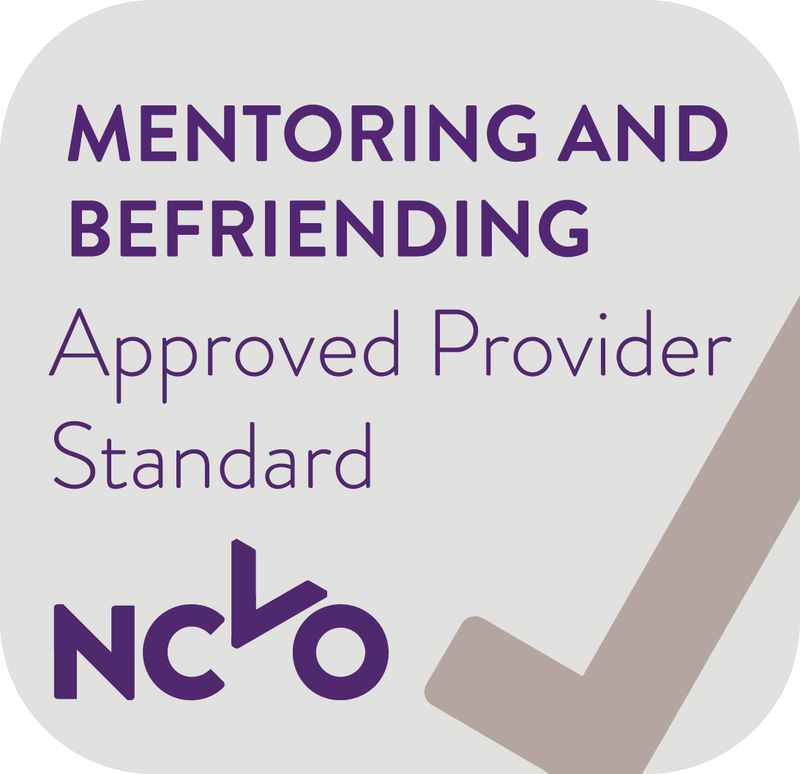 Accredited by the Mentoring and Befriending Foundation and awarded the Approved Provider Standard (APS), the programme has been tested and assessed, ensuring we are running a safe and effective service. The programme has a Toolkit and bank of resources. We can provide a ‘bolt’-on’ service to existing support programmes, or design a bespoke project. For example, we are the first organisation to provide a direct outreach support service to licensed betting shops across Islington and designed a project specifically for that purpose. Betknowmore UK provide workshops to a range of organisations and their front-line staff. The workshops are tailored to specific requirements and always includes hand-outs and resources for staff and clients. Resources and on-going support – provision of additional services, such as follow up 1:1 session with clients/employees if required. Cost: Due to the bespoke nature of our services we provide quotes as requested. We do however provide a reduced rate for low income charities and voluntary organisations. Thank you, Frankie and your team, for being guest facilitators and providing an informative and engaging workshop for our counsellors. The praise for the workshop was high among our counsellors. They appreciated the creative way you addressed what can be a difficult topic, and that you provided useful hand-outs covering all that had been discussed. The counsellors also very much valued the story your volunteer shared so honestly and openly about his experiences with gambling. It has opened their eyes to the challenges and reality of the problem. As you know, we offer a series of workshops each year to our counsellors. Yours was the best attended in a long time! Many, many thanks. The best part of the training is listening to personal stories about gambling, it really enables people who haven't experienced such [things] to understand the severity of the impact of gambling. Also, it’s always touching to see how someone seeking help has manage to turn their life around. Really informative and experienced people who were able to talk to us specifically about the people we support. 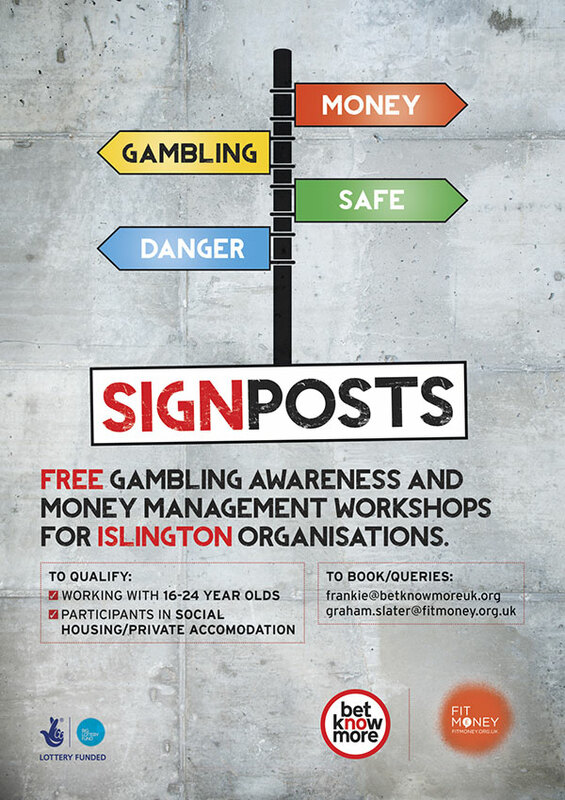 Our new workshop called Signposts combines gambling awareness and financial capability training. Developed in partnership with financial specialist training provider, Fitmoney, it provides training around two potentially high risk areas. It has been piloted across Islington to positive evaluation and delivered to organisations such as Jobwise Training, New Horizons, LIFT, and Leap Resolving Conflict. Betknowmore UK has given their clients resources and information that fits with their lifestyles and day to day decision-making in an effective and engaging way.